Strap yourself into your CZ Neutrozapper space fighter and prepare to travel through the many dimensions of the universe in order to save it. There are two rather worrying problems, though; the fighter is in need of repair, and you forgot to bring the servicing manual with you! This is a basic 3D shoot-'em-up; blast some aliens, then go to the next level. 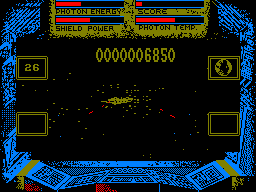 To make things slightly more interesting (but only slightly), every so often, your fighter will suffer damage, and you must repair it by replacing components on a circuit board within a time limit; if you run out of time, the ship explodes. There are no power-ups to collect, the frame rate is slow, and blasting alien after alien soon becomes very dull – and it doesn't help that the game itself crashes after a few levels. Ted Blewitt is going on holiday to Spain, but all his luggage has been stolen, so he must find his credit card and buy all of it back, and take and develop 36 photographs to prove to the staff at the Chip Factory that he really was away in Spain. You might remember Ted from his previous outing in Technician Ted. Well, this sequel looks and feels very similar indeed, although you can pick up and drop objects, and get drunk as well, which can sometimes prove useful... The graphics are still primitive and haven't been improved at all, the music is very annoying indeed, and the difficulty level is again much too high – and you can easily lose all your lives if you jump to another screen incorrectly. This is a game to avoid. This is based on the well-known TV quiz show that has been running on Channel 4 since the early 1980s. There are nine rounds in the game, which consist of three types – the anagram game where you attempt to make the longest word from nine letters; the number game where six numbers are picked and you have to use them to calculate another number chosen at random; and the final round, the conundrum, which is an anagram of a nine-letter word. You can play either against a friend or the computer, but it's no fun at all (you can cheat at the anagram game), especially since there are hardly any graphics to speak of, and the rendition of the theme tune at the start of the game is awful! 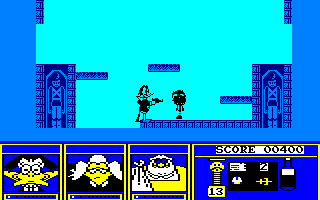 Anyone who's played the travesty that is Count Duckula II will wince in fear at the prospect of another Count Duckula game. But thankfully, its predecessor is not quite as awful! Based on an episode of the dire cartoon series, the aim is to wander around a huge pyramid, find keys to unlock doors, solve basic puzzles and get the magical saxophone at the pyramid's peak, which can transport Duckula back to his castle – all within a pretty tight time limit. I said this wasn't as bad as Count Duckula II, but it's still pretty bad – the graphics, though detailed, are boring and bland, and the sound... well, the hilariously bad rendition of the show's theme tune says it all! Too 'mazey' and too dull; avoid. See also: Count Duckula II. How could something like this ever have been released as late as 1992? To say this game is rubbish is scratching the surface. It's an absolute insult to my intelligence; I thought it was written in BASIC! 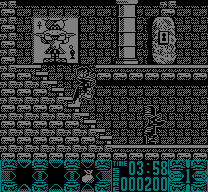 It's a slow and crushingly boring platform game with awful graphics and animation, poor collision detection and ping-ping sound effects, and the tomato gun that Count Duckula is armed with is useless. The tune is the only thing that's worth talking about. If you want to see an even funnier review of this game, you should look at Amstrad Action's review, where they gave it 3%. 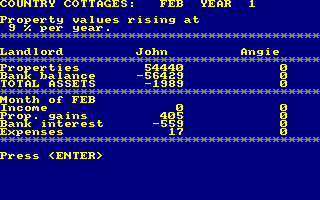 Country Cottages is a pretty simplistic strategy game where you and another player must buy, improve and lease out country homes until one of you is the first to reach a predetermined level of profit and so is declared the winner. It's about as interesting as it sounds. Apart from occasional still shots of your cottage – created using 'revolutionary' Landscape Creation technology (whatever that is) – the entire game is just boring facts and figures. And even if you're into that kind of thing, the game itself is too simplistic and shallow to offer any real challenge or depth. And so, as a result, it ends up pleasing nobody. To its credit, it's an original concept, but that's about the only positive thing I can say about it. A consignment of gold is being delivered across the desert and you have to follow the train on your horse, and grab some of it when it reaches the next station. However, there are other cowboys who are out to get you! 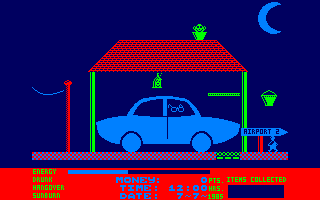 The music sets the scene nicely and the graphics are quite colourful, too, with some impressive animations. However, the game is a little difficult and it is really beneficial if you remember the layout of each level exactly – the timing is crucial! 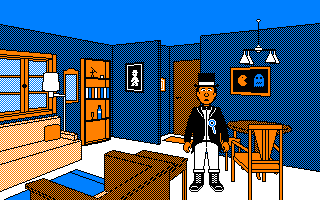 CPC Aventure, as its name implies, is an adventure game with a very interesting storyline. You wander around in the world of the CPC and interact with almost all the famous heroes and characters with which we grew up. The game features nicely drawn graphics and it is quite big. There is almost no sound, but the feeling of meeting again with the most memorable sprites of the CPC era is an unprecedented experience that elicits strong emotions. The grab factor is very strong and the dialogue is very well written. It is a very well conceived game. In my opinion, this is one of the best CPC adventures ever. The evil Dr. K is planning to take over the world with a race of biogenetic humanoids. Enter Andy Attacker and Ben Breaker, two guys on a mission to fight their way through sixteen levels of mayhem in Dr. K's fortress. Don't you just love original plots? Anyway, this is a reasonably good game. You (and another player if you can find one) must explore each level and plant some detonators at specific points, and find the exit quickly before they explode. Fortunately, there's a map which shows you where to plant them. There's a lot of shooting involved as well, and the humanoids are rather nasty as well. The graphics are pretty good and the sound effects are OK, but it's a bit too difficult (although you get plenty of credits) and the collision detection could be better. 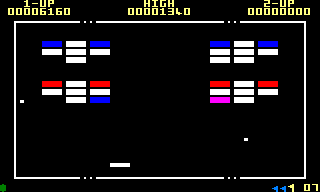 Breakout has been around since 1976, and this version of it is probably deliberately based on the versions from the early days to give it that retro feel; all the bricks are blocks of one colour, and the ball is simply a square. The sound effects are few and far between as well. 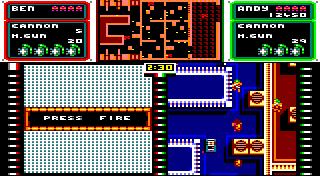 OK, so the presentation might be minimal, but the levels are rather badly designed, and it's very difficult to clear all the bricks from each level; often you rely on collecting a power-up which sends you to the next level. At least you can choose which level you want to start on.